to the memory of Wardell Quezergue. I do hope I have done you justice. This page is mostly text – but it has an important message. If you want to know about a really wonderful tale of music and its ability to tell a story, transcend time – and impact lives, please read on and learn about The Creole Mass. This is one of many stories that typifies the exceptional spirit of New Orleans and its people. I believe it will leave you moved. About six weeks prior to Wardell’s death on 6th September 2011, Bubby told him about this page during dinner. I am glad that we have brought the work of a truly remarkable musician to a wider audience – and that Wardell knew of this before he died. “Who is he?” you may ask. We may not have met him before, but we certainly know his work. Wardell was an arranger, composer, and conductor to whom what we think of as 'the New Orleans sound' owes a huge debt. He has been called The Creole Beethoven . His arrangements and studios have a long and illustrious clientele including Paul Simon, Willie Nelson, The Neville Brothers, Fats Domino and BB King. What is a Creole Mass? 1. Original to, or born in Louisiana. 2. Any person who claims decent from the region’s earliest settlers or inhabitants. 2. The property of something that is great in magnitude. This story of The Creole Mass is also the story of another great and unsung person of influence in New Orleans – Bubby Valentino. A renaissance man if ever there was one in this century, Bubby and his family have a long history in New Orleans and across the river in Mississippi, where the family home still stands in legacy of a rich cotton history. I met Bubby when he attended a workshop for the development of the Music and Film Strategy for New Orleans that I was leading. He said very little, but listened a lot. I thought such a distinguished person didn’t attend just to listen, so asked to meet and have a cup of coffee, and discuss his interests. I used to joke that I was single-handedly keeping alive the coffee industry in New Orleans - as so much business is done within coffee houses and bars in this creative city. It was one of the most rewarding cups of coffee I have ever enjoyed, for it led to me meeting Bubby later at his office and seeing the video of the Creole Mass and hearing the real story behind it. Bubby is, as well as a hotelier and businessman, a designer, and a musical – how should I say? ‘Impresario’. One evening, he was sitting in the foyer of a recording studio at the same time as Wardell Quezergue, who had a great wad of music and was marking it up. Bubby enquired about the music and the story unravelled. The sheets of music represented 50 years of work. It was his Opus, his masterwork – and completed his promise to God. In 1951, Wardell was an Army musician, arranging the music and conducting an elite Military Band in Japan. During a performance one night, the Commanding Officer interrupted by taking the microphone and advising that the concert was closed and that the band and all military personnel should report to base. It was the start of the Korean War and quickly Wardell and his companions were in a convoy headed for the airport to fly out the front. Someone was going from truck to truck, asking for Wardell Quezergue. The Commanding Officer had ordered another soldier to take his place. Wardell was to return to base. The C.O. said he was the only person who could arrange music well enough to keep a band going with the remnants of Army musicians left in Japan. Some time later news reached Wardell that his replacement had been killed in action. Struck by the fact that he had been so strangely spared, Wardell felt that God must have a purpose for him. He immediately made God a commitment to write the absolutely best mass that he could – in memory of his dead counterpart, and in thanks for the saving of his life. Apparently Wardell simply replied: “It had to be the very best I can make it...” adding, almost wistfully “... but it will never be performed”. Bubby was astounded. Fifty years work by one of the best arrangers and musicians in New Orleans - and his Master Work wasn’t to be performed? He asked why and was told that it required almost 300 musicians and no one would finance it. So that is how it all started. Bubby knew that there were many musicians – and famous ones – who owed their whole career to the work of Wardell Quezergue. Wardell was there that night at the studio to make arrangements for a small recording of some parts of the Creole Mass so he could hear what it was like. Bubby was thoughtful. Then he intervened, talking the studio owner into donating the studio time. Together with Wardell, he talked with other musicians to make a recording, which he underwrote. On the day of the recording session, the sound-studio owner and Bubby were in the control room. As the Creole Mass started, they stared at each other. “This is good”. The point is that Wardell is himself Creole. His life has traversed the times of racial division and hatred, integration, and a new openness. Therefore, the Creole Mass was designed not just as a great musical work – but as a work of joyful togetherness – designed to break down all socio-economic and racial barriers through a musical performance. It includes parts for gospel choirs, school and city elite choirs: not to sing in their own groups, but as a seamless single choir. It includes the orchestra and the brass bands of the poorer neighbourhoods, and the irrepressible music, dance - and umbrellas and hankies of the Jazz funeral and the second line. 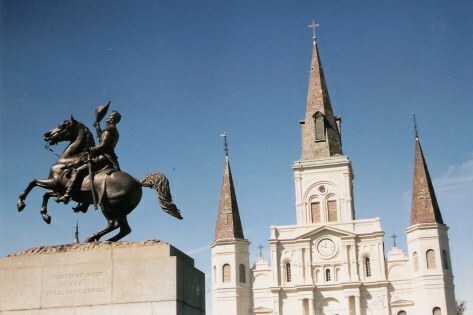 The natural venue for the non-denominational premier of The Creole Mass was the beautiful St Louis Cathedral in the French Quarter – or to give it the correct name: 'Cathedral of St Louis King of France'. Since before there was a United States of America -since 1727 - this has been the site of the Roman Catholic Church of New Orleans. The present day cathedral replaces an earlier one which was destroyed by fire and in which successive Spanish and French Governors had worshipped along with a mixed-denomination, mixed-race congregation over a period of over 60 years. For more than 200 years, St. Louis Cathedral has welcomed Creoles and people of all colours, regardless of ethnicity or religious affiliation -but it took Bubby’s intervention to gain approval for the Creole Mass to be performed there as a concert. (Following the performance, The Creole Mass achieved the rare distinction of being sanctioned by the National Conference of Catholic Bishops as liturgically correct to be perfomed in any Catholic parish in the United States). Bubby was anxious about whether people would fill the audience. His whole family drew in behind him in support, from his mother and sisters writing personal invitations to the New Orleans society 'A List', to his son inviting the legendary jazz photographer Herman Leonard whom he knew through Herman frequenting his music store. Before Hurricane Katrina destroyed his house and over 6000 hand printed photographs from his archive, Leonard lived in New Orleans. Herman Leonard died on August 14, 2010. His life was celebrated by friends and family with a traditional New Orleans Second Line. the soul of the musicians, the singers and the locations where they played. His work is definitive. His personality was warm. His work was masterful. He will be much missed, but he left us with beautiful and evocative images of the era in which he lived and its musical legends. Here he speaks about some of his iconic photos of famous jazz personalities - how they came about and the significance of the effects. But back to the story of The Creole Mass. Despite all the preparations, Bubby was anxious – right up to the opening chords – but he had been so busy looking after everyone else that he forgot to reserve a seat for himself - and it was a packed house! That is how, on the evening of the 28th of August, 2001, the Creole Mass came to be finally performed – and captured on DVD. It featured almost 300 performers - all natives of New Orleans - some travelling vast distances and taking time from their professional careers – one from the NY Metropolitan Opera – to perform, free of charge. People loaned – with no contracts – incredibly valuable and irreplaceable equipment to make the event technically as sound (pardon the pun) as possible. No one asked for payment. The former CEO of the Arts Council New Orleans, Shirley Trusty Corey - another remarkable person some of whose achievements appear on the 'New Orleans Performers' page, was there. She said it was one of the most moving and soul-stirring events of her life. The press agreed. ...just look at the faces of the singers. I have never seen a choir where everyone is so joyful as they sing! Send your feedback to Bubby, whose email address is there, so he and Wardell's family see that The Creole Mass has touched people world-wide. If I ever find the investment to do so, I have a plan to propose for the Creole Mass. It could be the foundation of an ongoing performance – with touring company. It could enliven young talent – including those who not academic achievers, but who have musical ability. You don’t have to have Julliard training to be the tambourinist in the Creole Mass. But it could be a valued career. Additionally, in a stage and touring production there are lots of jobs that don’t need music: just good organisational skills. I can envision The Creole Mass as a great economic development activity, inspirational training centre, show and touring company - giving opportunity to those who previously had none, and providing a valuable steady injection of funds to the economic base of the city. I would love to drive this project. When you sing you pray twice. Whether you believe in God or not – the Creole Mass is an inspiring production and a true example of the New Orleans spirit – typical of what makes this the most wonderful place to live and work – and of course, to visit. Here is a link to a pastiche of Wardell Quezergue's Funeral.